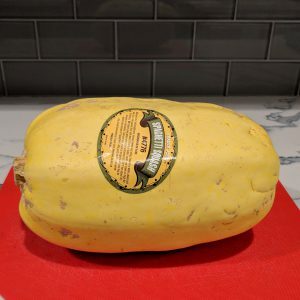 The first time I heard about Spaghetti Squash I was like… what in the world is spaghetti squash and how do I cook it? 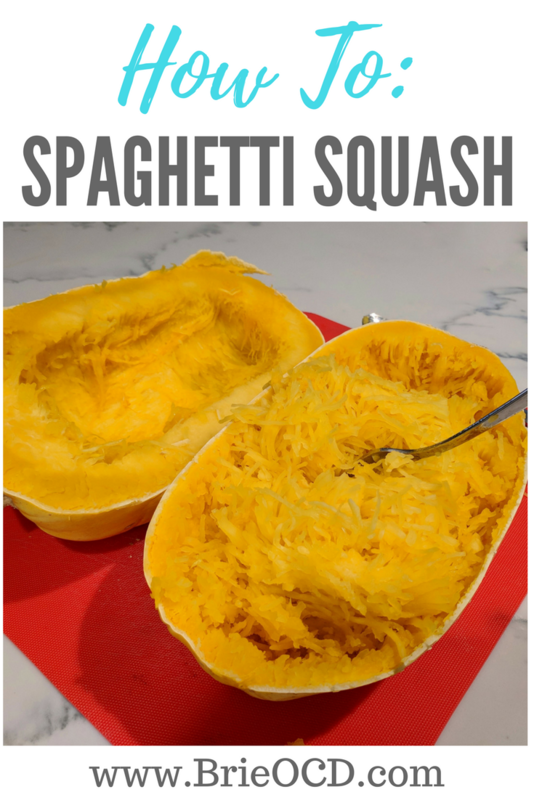 Spaghetti squash is the healthy alternative to …. you guessed it! Spaghetti! Or really pasta in general. I still remember the first time I tried it. My roommate Andrea was making a shrimp “pasta” dish and said she was making spaghetti squash instead of pasta. I had NO IDEA what in the world that was. Flash forward to 2013 and I finally made it myself! I roasted it in the oven the first time and I have to say I was disappointed. I know some people swear by it but cutting through a raw squash was nearly impossible, it took a LONG time AND it was still crunchy. Granted it was my first time making it but the next time I threw it in the microwave instead and haven’t looked back! It is super easy in the microwave and doesn’t require superhuman strength. You simply slice holes randomly in the squash to let some air flow in. Place it in the microwave on a couple paper towels for 7 minutes. Rotate and then microwave for another 7 minutes. Timing depends on the size but for the most part if you have a medium to large squash that should be sufficient. If its smaller than I would start with 5 minutes each and feel it. The shell should be soft to the touch but not mushy. CAUTION it will be HOT. I mean really hot. 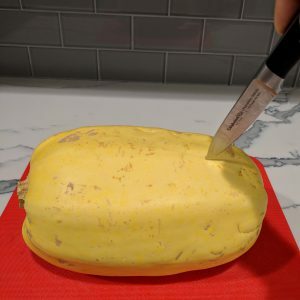 Grab some silicone pot holders to transfer the squash to a cutting board. You then want to slice it down the middle and scoop out the seeds and strings with a spoon. From there you take a fork and shred the squash (as pictured). 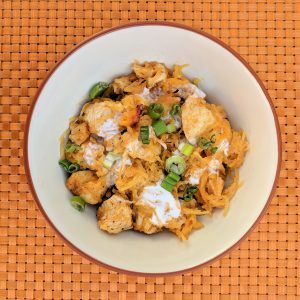 See printable recipe below for step by step instructions with photos! When in season Trader Joe’s ($2.49) and Costco (2 for $4.99) sell spaghetti squash for cheap. However they don’t carry them all year round. In that case you will need to go to your local market (for me, Von’s) and buy it there. They charge you somewhere from .99- 1.99 a pound so as you can imagine it gets a little pricey. At the end of the day it is totally worth it to me because you get your fill of “pasta” with a side of health. And as we know….. HEALTH IS WEALTH!! 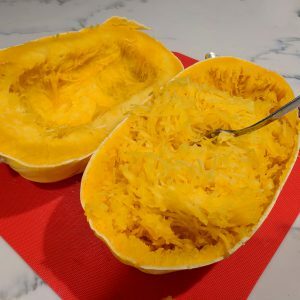 slice holes randomly in spaghetti squash. 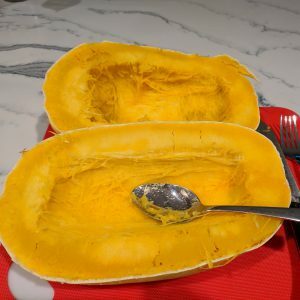 place squash on two paper towels and microwave for 7 minutes. 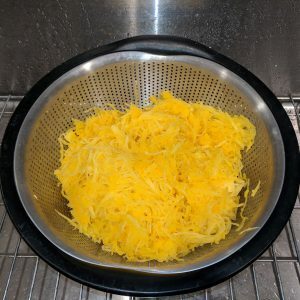 flip squash and microwave for another 7 minutes or until semi soft to the touch. 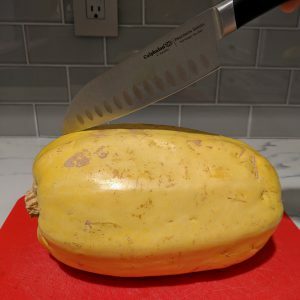 slice squash in half long ways. take spoon and scoop out seeds and stringy area. take fork and shred/pull the squash. it will look like spaghetti! strain squash so you get rid of excess water. serve with meat sauce or make buffalo chicken bake, pesto chicken bake, pizza bake. Skies the limit!! !